The standout track from the Beastie Boys' smash hit Ill Communication album nearly didn't make it onto the record at all — and when it did, it was the eight-track ADAT mix that made the final cut. 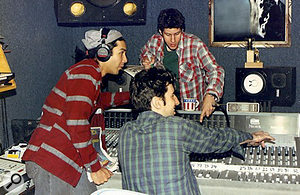 Mario C with Mike D (standing) and Money Mark in the control room at G-Son. 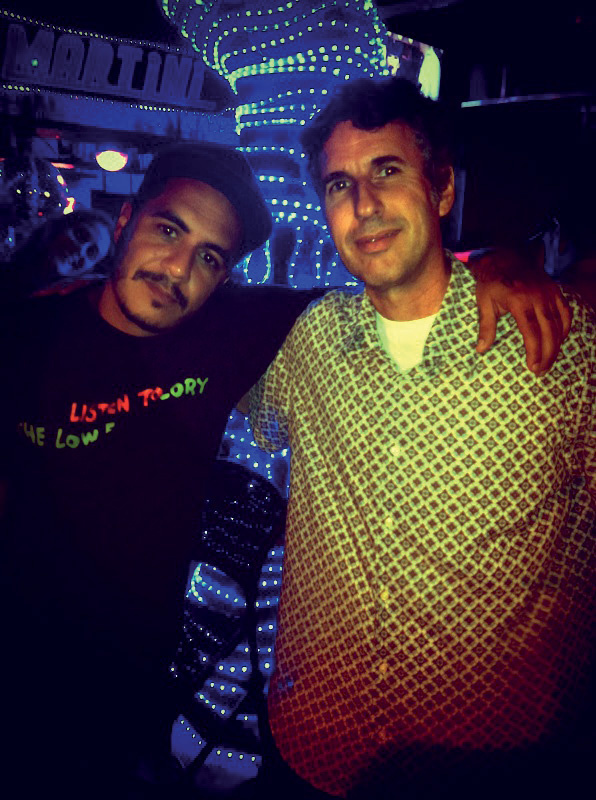 A native of São Paolo, Brazil, who relocated to LA with his Italian father and Brazilian mother as a two-year-old in 1963, Caldato — also known as Mario C — has production and engineering credits that include Tone-Loc, Björk, Beck, Super Furry Animals, Money Mark, Marcelo D2, Seu Jorge, Young MC, the Jon Spencer Blues Explosion and Hawaiian folk-rock singer-songwriter Jack Johnson. These are in addition to his work with the Beastie Boys on Paul's Boutique, Check Your Head, Ill Communication and Hello Nasty. Listening to anything from the bossa nova rhythms of Sérgio Mendes and Brasil '66 to contemporary '60s and '70s pop, rock and soul while growing up in a predominantly black area of Los Angeles, Caldato initially learned to play an organ and piano that his father bought for him. After that little setup had run its course, Caldato did finally get to play the organ in a school rock band. "I wasn't a great keyboard player, I didn't practice, but I enjoyed being in the band and I ended up running the lights and creating crazy sound effects with a synthesizer that I bought,” he says. "I kind of got more into that, and then I had another friend who joined the band; a real keyboard player whose name was Mark Nishita, later known as Money Mark. I always drove the bands around with my station wagon, setting up the PA and lights, and when several of my friends stopped playing I bought some of their instruments and some microphones. The next thing I knew, I was DJ'ing at wedding parties, too. Armed with a little PA mixer, I also did the sound for bands, and that whole thing took off when I quit playing. "At around the same time, I set up a little studio with Mark. He had a four-track machine but there was no room at his house. So he brought his equipment over to a back-house that I rented from friends and we set up a little studio space in there. He taught me all the basics: how to run the tape machine and thread it, set the sound levels, keep an eye on the meters and so on. He had a little Yamaha four-track PA mixer with bass, treble and reverb, so I slowly figured it out. We did that for a few years, from the time I was 18 years old until I was about 22 or 23; just horsing around and recording Mark playing all of the instruments. "It got to the point where we added some cool stuff, had some acetates made and sent them to the local radio station in the hope of some spins. Then Mark decided to form a band with his brother Mike playing drums and, since I was listening to a lot of reggae and getting into the bass, Mark asked me, 'Why don't you just learn a couple of notes on the bass?' So I started playing bass, we also had our friend Bill on guitar and we called the band the Jungle Bugs. When we had an opportunity to do some recordings at a 16-track studio with our friend Brian Foxworthy, I ended up financing and producing our first seven-inch single, and that was a real exciting and fun thing to do; on our own with no label. Mario Caldato Jr with the Beastie Boys, from the sleeve of Ill Communication. "In '85, I was frequenting Power Tools, which was a really unique alternative/artsy LA nightclub with a great mix of people and music,” continues Caldato. 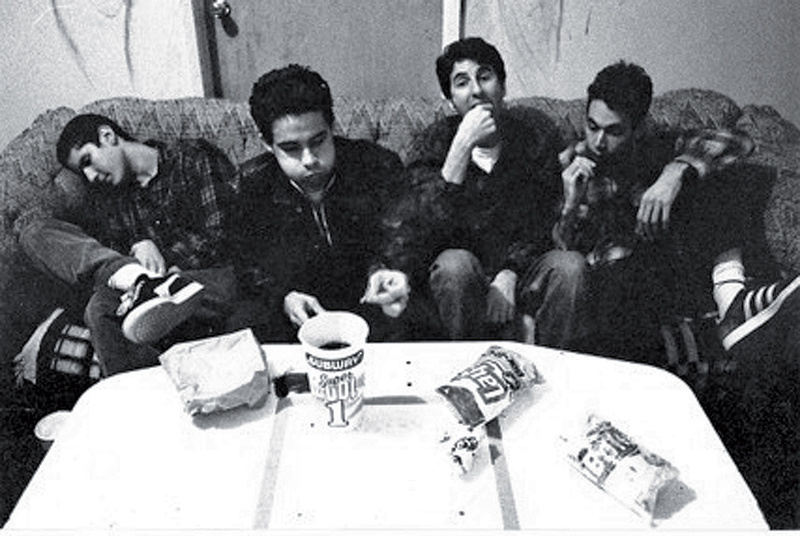 "One night when I was there, the Beastie Boys were about to perform. They had been opening for Madonna on her Virgin Tour and they were going to perform a couple of songs that night, so they walked on-stage, DJ Hurricane began scratching the intro of the record and when the first 808 [kick drum] played, it took down the sound system. It was like uh-oh, bummer — a thousand people in the club and there's no sound. The Beasties threw their mics down onto the stage and they were a little pissed — they couldn't perform. "Talk about embarrassing for the venue. I went up to a security guard and asked, 'Who runs this place?' He said, 'That guy over there,' pointing to this cat Jon Sidel. So, I went and told him, 'Hey, you need a sound man.' He said, 'Tell me about it! What do you know about sound?' I said, 'Well, I'm a sound man.' He said, 'Then come and have a look at our system!' When I took a look, they had something like a Marantz receiver and a small SAE amp powering four Cerwin Vega speakers. The system was completely under-powered and it went thermal, heating up and shutting off. About five minutes later the sound came back on, but by then the guys had left the stage. 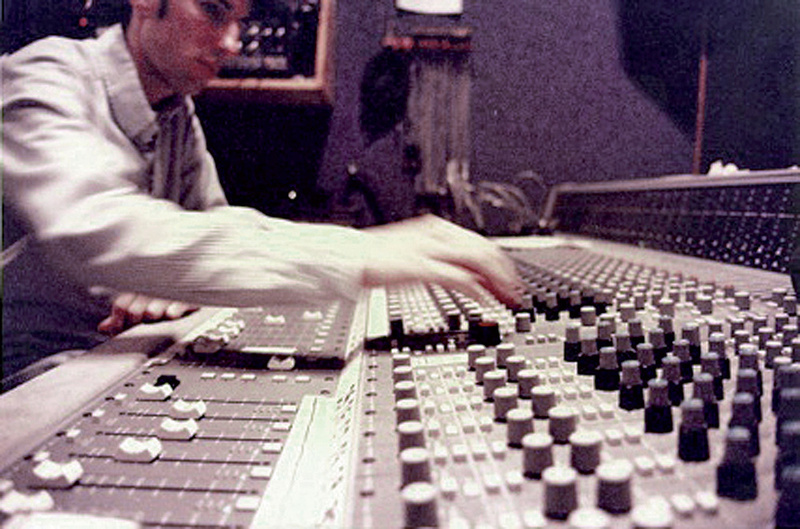 'Mario C' at the Neotek Élan console in the Beastie Boys' G-Son studio. "When I told Jon I had some bigger power amps and proper cabling and knew where to place the speakers, he said, 'OK, come back next week and bring your stuff!' So, I did. I hooked it all up, they were amazed at the sound and from then on I had the gig locked. I then became friends with the DJ, Matt Dike, and one day, when he said he was interested in making a recording, I told him I had experience and some equipment and could help him. He was to buy a Tascam 388 eight-track mixer-recorder and an SP12 sampling drum machine which he had heard everyone was using to make hip-hop records. So we went to the music store, bought the gear and set up shop in Matt's Hollywood apartment. We turned the living room into the control room and there was a little closet that we converted into a vocal booth. "I had some mics — an AKG 414, 451s and some Sennheiser 421s — and I brought them to Matt's home studio along with a Yamaha 2020 compressor and REV 7, SPX90 reverbs and some Ibanez outboard delays, and he just went crazy; sampling and creating these breaks and loops and making songs out of them. "Matt had a friend named Michael Ross who, I think, was an A&R assistant, and he'd got hold of some demo tapes that the record company threw in the trash. A couple of them he noted were pretty good: 'Who's this guy? Tone Loc? And Young MC?' He called them from his home instead of from the office and said, 'Hey, we've got a little studio and we want to make some tracks. You want to come down and rap?' Sure enough, they showed up and things started happening. That was the beginning of Delicious Vinyl. In 1988 and 1989, Delicious Vinyl enjoyed Top 10 US chart successes with Tone Loc's 'Wild Thing' and 'Funky Cold Medina' and Young MC's 'Bust A Move', sampling rock songs and turning them into rap hits. Mario Caldato Jr recorded these million-sellers as well as each of the aforementioned artists' equally successful debut albums: Loc-ed After Dark and Stone Cold Rhymin'. 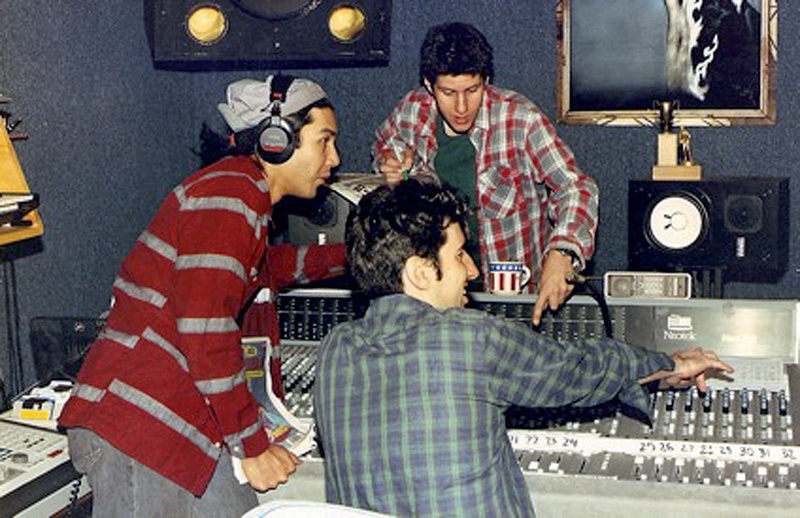 In 1988, following the commercial and critical success of their first album, Licensed To Ill — which garnered the immortal Rolling Stone headline 'Three Idiots Create A Masterpiece' — the Beasties ended their relationship with Def Jam Recordings and the label's founder, producer Rick Rubin, to sign with Capitol. Immediately, Matt Dike saw this as his opportunity to step into Rubin's shoes behind the console. Hip-Hop DJs Michael Simpson (aka EZ Mike) and John King (aka King Gizmo) had already produced and sequenced tracks on the Tone Loc album when Dike thought of pitching some of their material to the Beasties. 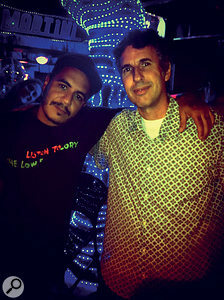 Mario C with Marcelo D2 in Brazil. It was a record that, upon its July 1989 release, initially didn't match the success of its predecessor Licensed To Ill, in terms of either sales or critical plaudits. Sonically, musically and lyrically more experimental, Paul's Boutique would, nevertheless, eventually be certified double-platinum while many critics would reappraise it as a landmark in the annals of hip-hop. No fewer than 105 different songs were sampled for its 15 tracks and 'Looking Down The Barrel Of A Gun' was the only one of them to feature live instrumentation in the form of bass and guitar. Yet another different approach was employed for the 1992 follow-up, Check Your Head. 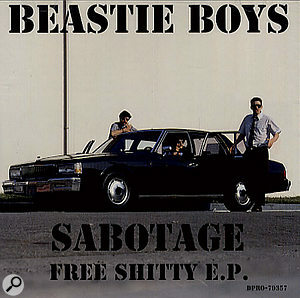 Released on the band's newly formed Grand Royal record label, this return to the Beasties' punk roots saw them playing their own instruments, alongside Money Mark on keyboards at their G-Son studio, while co-producing with Mario Caldato Jr.
A Top 10 record in the States that peaked at just 107 on the British chart, Check Your Head coincided with the Beastie Boys' first concert tour in several years and served as a template for Ill Communication, their second American chart-topper and second triple-platinum album, which climbed to number 10 in the UK. "The tour was a big confidence booster and everyone was on top of their game,” says Caldato. 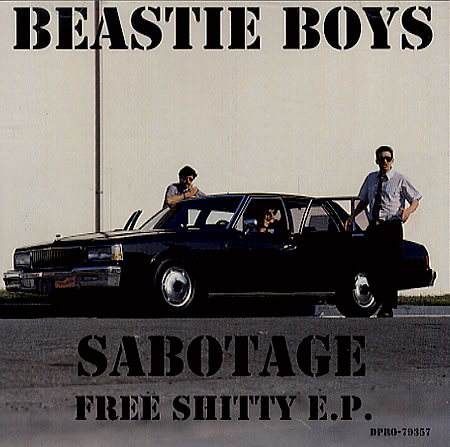 "The Beasties played half of the numbers, rapped the other half and came up with ideas for their next record. This time, the studio was already dialled in and we did the album in six months, but we started out by recording in New York for the first month, just to get a different vibe from playing in a different place. The studio was called Tin Pan Alley and it was a super facility in the Tin Pan Alley area of the city, very old but cool and funky. So we set up all of the band stuff in this one little room where there was, I think, an API type of vintage console. The EQ had a low-end filter cut/boost and high-end filter cut/boost, and they also had these really old custom valve preamps and an Otari 24-track tape machine. "As I looked out into the studio from the control room, Mike Diamond's drums were to the left and then there was Adam Horovitz's's guitar rig, Adam Yauch's bass, Money Mark's keyboard and, at far right, a percussion kit that Eric Bobo played. My standard setup for drums was Sennheiser 421s on the kick and toms, Shure SM57s on the top and bottom of the snare, AKG 460s for the overheads and 451s on the hi-hat. By then, I myself had a couple of tube [Neumann] U47s and those were the room mics. 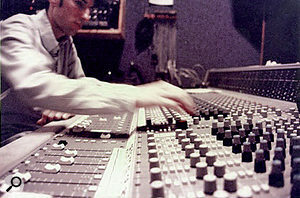 According to Caldato, none of the songs were completely written prior to the band entering the studio. Instead, the material either evolved out of jam sessions or was created later with loops and editing. "'Bobo On The Corner' was created live while jamming,” he says. 'The same for 'Sabrosa', 'Futterman's Rule', 'Eugene's Lament', 'Ricky's Theme', 'Heart Attack Man', 'Shambala', 'Transitions' and 'Sabotage'. We didn't have any of those numbers when we went to New York. When we returned to LA, we had them as basic tracks and then crafted them into fully fledged songs. The other tracks I didn't mention were all rap songs created with loops, and within those loops we'd add an acoustic bass, a live drum or something like that. However, those numbers were mainly based on loops. "The starting point for most of the songs was an idea that came from touring, and in some cases we even pulled up cassette recordings of the soundchecks. However, there were also tracks that evolved out of nothing, and a prime example of that is 'Sabotage', which just happened. Adam Yauch was in the studio, working on his bass sound with the Superfuzz pedal that he loved, and he came up with that riff and kept jamming it for a while. He'd really get deep into stuff and focus hard on it. Eric Bobo heard that riff while sitting in the control room and he ran out and started playing a rhythm on the timbales, at which point Mike D entered the control room and said, 'What's going on?' 'Go in there,' I told him. 'Follow Bobo.' So, that's what he did, accenting the bass riff with his drums, because it's really the bass riff that drives and makes the song. "In terms of the vocals, there may have been an attempt by Ad-Rock to do something, but the song still had no theme and no concept, and he finally said 'Nah, it ain't happening. Forget it.' So, we kind of left it alone, went back to G-Son in LA and continued working on the rest of the record. We had a bunch of tracks, a bunch of looping stuff that needed to be done, and I was also mixing some of the instrumentals; adding different elements while finding little parts that we liked to create a finished track. We were at G-Son from Monday to Friday for five months and throughout that time, even when we weren't working on the music, we'd hang out, shoot basketball and girlfriends would show up. At other times, Biz Markie and Q-Tip would also show up to record their vocals, along with the Jungle Brothers and whoever else was in town. "He didn't want to do it at their studio, so I said, 'Fine, we can demo it at my house.' As I had a little home studio, I took the two-track mix that I had made of the song, threw it down on to an ADAT on two tracks — left-right — and had six tracks on which to mess around with vocal ideas. Then I set up the Sennheiser 421, Ad-Rock came by and he performed the lyrics that you hear on the record. He nailed it in one or two takes and I was like, 'Oh, my God, that's it! You did it!' It was perfect. He had done his homework and he was screaming it with the exact amount of energy and attitude needed. 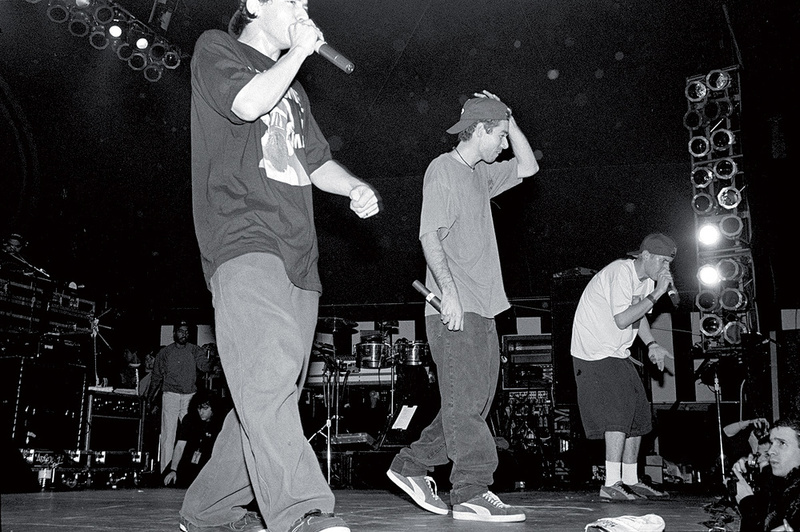 "Being rappers, the Beasties felt comfortable using hand-held vocal mics. They didn't like the idea of singing into a big mic with the pantyhose [pop filter]. What's more, Ad-Rock and Mike D have those high voices, so cuffing the mic actually made them sound a little thicker and roughened them up. It worked out good, I'd compensate with EQ and, as there were no playback speakers to feed back, it just had a different sound. I don't think I ever used condenser mics with those guys. They used hand-held SM58s and MD421s, as well as cheap karaoke mics. Our secret weapon for 'So What'cha Want' [the second single from Check Your Head] was a $29 Sony Variety karaoke mic.